We're delighted that you're interested in joining us at ANU. We welcome close to 9,000 overseas students to ANU every year. If you would like to call ANU home too, there are different ways to apply, depending on what you want to study. 1. Applying for one of these degrees? Are you interested in studying one of these programs at ANU? Each one has specific admissions criteria. Use the button below to start your application. This also includes one-year full-time Honours programs and flexible degree programs. Or, if you're completing an Australian Year 12, a New Zealand National Certificate of Educational Achievement (NCEA) Level 3, or an International Baccalaureate (IB), you need to apply through the Universities Admissions Centre (UAC). Doctor of Medicine & Surgery (MChD). Applications for Semester 1 2020 are open now. Minimum requirements for entry to these programs may include providing a portfolio, doing an audition or providing additional documents to support your application. Check Programs and Courses to see if additional requirements apply. An application fee of A$100 applies. For most other degrees at ANU, you can now apply and be assessed under our new admissions processes. There are two student intakes each year - Semester 1 and Semester 2. Semester 1 2020 applications are open now and will close 15 December 2019 - see our timeline below. Semester 2 2020 applications will open 28 November 2019 and will close 10 May 2020. You can only preference a single program, so check Programs and Courses to choose the best program for you. There are three assessment rounds in each semester. 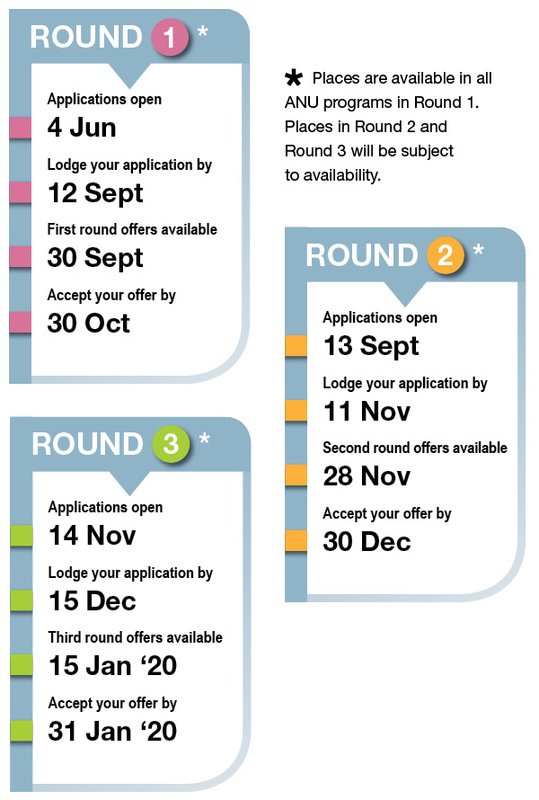 Apply in the first round, and you have three opportunities to be assessed and accepted, giving you the best chance of being offered a place at ANU. When you apply, you must meet pre-requisite and cognate requirements for your preferred program, and English language requirements by the application deadline for the round. You will be ranked against other candidates applying for the same program. Understand how we assess applications and make offers to study at ANU. Prepare your academic and English language competency documents. You must meet English language requirements by the application deadline. You must hold a current visa which entitles you to study for the duration of your degree program. Australian student visa conditions require that you hold valid Overseas Student Health Cover (OSHC). Got a question? See if the answer you're looking for is in our FAQs.